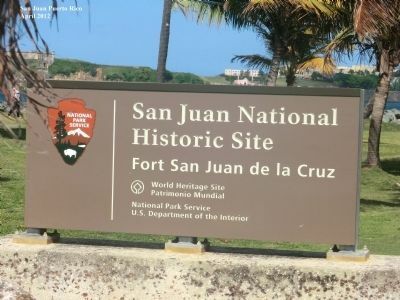 Wind, rain, salt, sun, plants, people and time all do what foreign invaders never did—tear down the stone and mortar walls at Fort San Juan de la Cruz. Preventing a historic structure like El Canuelo from falling into decay is a never-ending task. Park staff work to preserve this small fort by controlling drainage, removing plants, and repairing structural damage. You can help by staying off the walls and not writing on them or damaging them in any way. El Canuelo is an irreplaceable reminder of our past. Please help care for it. Water surrounded this fort until the U.S. Army built land around it in the 1940s. The structures on top are the remains of a 19th-century leprosy quarantine station. 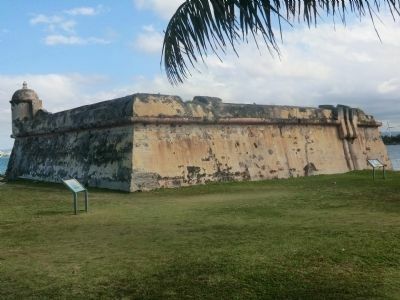 Protecting Fort San Juan de la Cruz from relentless sun, wind, and rain requires constant care. Volunteers pick up trash around El Cañuelo. de la Cruz. Prevenir que una estructura histórica como el Cañuelo se deteriore es una tarea interminable. Las trabajadores del parque nacional se empeñan en preservar este fortín controlando el drenaje, removiendo la vegetación y reparando daños estructurales. Usted puede ayudar no subiendo a las murallas, no escribiendo en ellas o no dañándolas de cualquier otra forma. El Cañuelo es un legado irremplazable de nuestro pasado. Ayúdenos a cuidarlo. Este fortín estaba rodeada de agua hasta que el ejército de EEUU rellenó de tierra su alrededor en la década de 1940-1949. Las estructuras en el tope son los restos de un asilo de leprosos del siglo XIX. Proteger el Fortín San Juan de la Cruz del implacable sol, viento y lluvia requiere cuidado constante. Voluntarios recogen basura alrededor de El Cañuelo. Location. 18° 27.972′ N, 66° 8.184′ W. Marker is in Palo Seco, Puerto Rico, in Toa Baja Municipality. Marker is on State Highway 870. Touch for map. Marker is in this post office area: Toa Baja PR 00949, United States of America. Touch for directions. of this marker); Imagine Life Here (within shouting distance of this marker); The Main Plaza (approx. 0.9 miles away); A Defense of the 1st Order (approx. 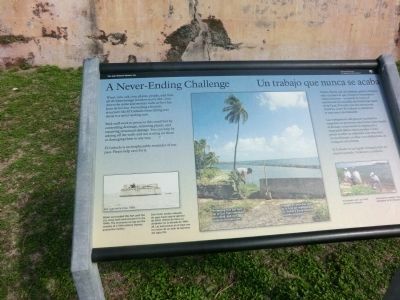 0.9 miles away); a different marker also named Defending San Juan (approx. one mile away); Francisco de Miranda (approx. 1.3 miles away); Casa Natal de Don Ramón Power y Giralt (approx. 1.3 miles away). Touch for a list and map of all markers in Palo Seco. More. Search the internet for A Never-Ending Challenge. Credits. This page was last revised on June 23, 2016. This page originally submitted on October 5, 2012, by Don Morfe of Baltimore, Maryland. This page has been viewed 375 times since then and 9 times this year. Photos: 1, 2, 3. submitted on October 5, 2012, by Don Morfe of Baltimore, Maryland. • Bill Pfingsten was the editor who published this page.